The MWA consists of 4096 dual-polarization dipole antennas optimized for the 70-300 MHz frequency range, arranged as "tiles", each a 4x4 array of dipoles. A complete technical description of the Phase I telescope is given in the journal article: The Murchison Widefield Array: The SKA Low Frequency Precursor by Tingay et al. (2013), and a Phase II description can be found in the article The Phase II Murchison Widefield Array: Design Overview by Wayth et al (2018). The array has no moving parts, and all telescope functions including pointing are performed by electronic manipulation of dipole signals, each of which contains information from nearly four steradians of sky centered on the zenith. Each tile performs an analog beamforming operation, narrowing the field of view to a fully steerable 25 degrees at 150 MHz. The majority of the tiles are scattered across a roughly 1.5 km core region, forming an array with very high imaging quality, and a field of view of several hundred square degrees at a resolution of several arcminutes. The remaining tiles are placed at locations outside the core, yielding baseline distances of up to 6km to allow higher angular resolution for solar burst measurements. The MWA is located within the Murchison Radio-astronomy Observatory (MRO) in the Shire of Murchison in Western Australia (WA). Take a virtual tour of the MRO! The MWA site is over 200 km inland from the western Australian coast, and approximately 300 km from the small coastal city of Geraldton which lies a few hundred kilometers north of Perth. The target region is extremely sparsely populated, and is characterized by fairly flat, sparsely vegetated, semi-arid terrain criss-crossed by shallow washes and watercourses. Particular strengths of the Murchison area for siting the MWA include excellent sky access, with the Galactic Center and the Magellanic Clouds reaching high elevations, and extremely low levels of radio frequency interference (RFI). Designated by ACMA legislation as a protected radio-quiet zone, there is strict control of radio transmitters at various distances from the MRO. Until the 1980’s this land was primarily used for sheep, with signifcant wool production and gradual transition to cattle, but has been destocked since 2016. The nearest accommodation is at Boolardy station, 40km south of site, then Wooleen station, approximately 70km from site. The land is leased by the Commonwealth Scientifc and Industrial Research Organisation (CSIRO). In addition to the MWA, the MRO is home to CSIRO's Australian SKA Pathfinder (ASKAP) telescope, and will be the site for the international Square Kilometer Array (SKA) low frequency telescope. We acknowledge the Wajarri-Yamatji people as the traditional owners of the MRO site. The MWA was originally to be situated at Mileura Station where initial testing had been conducted, before being moved southwest to Boolardy station in outback Western Australia. This location offers a quiet radio environment and stable climate for observations. 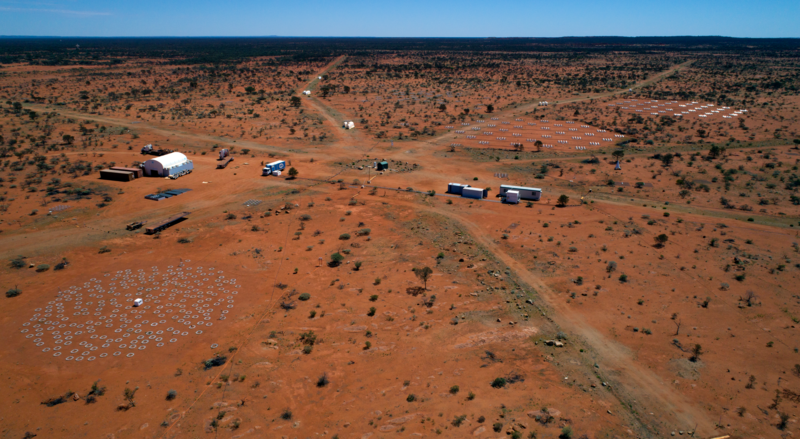 The MRO is also the site of CSIRO's Australian Square Kilometre Array Pathfinder (ASKAP) and one of two selected sites for the Square Kilometre Array (SKA). In addition to the geographic link, the MWA is one of four official SKA precursor telescopes - instruments that provide instrumental, scientific and operational information to help guide SKA developments. The MWA was initially conceived as a 512-tile instrument (512T) to be built in stages; see Lonsdale et al. (2009). The first stage was a 32-tile prototype (MWA-32T) which was constructed and operated with increasing capability over the period 2007–2011, testing telescope hardware and making preliminary science observations, including initial observations of EoR fields. The first phase of the telescope, the so-called 'Phase I MWA' achieved full practical completion in late 2012 and completed commissioning on 20 June 2013, before moving into full operations. The Phase I MWA was the first so-called large-N array, fully cross-correlating signals from 128 phased tiles, each of which consist of 16 crossed dipoles arranged in a 4x4 square. As part of a planned future roll out infrastructure on-site at the MRO was installed during Phase I to allow an eventual build-out to 256 tiles. The total cost of the first phase of the project was A$51 million. The Phase I array was largely driven by the 2nd MWA Director, Professor Steven Tingay. In 2017 the telescope received the planned substantial upgrade, doubling both the number of antennas and the resolution of the instrument; increasing the sensitivity by a factor of approximately 10. This upgraded instrument is known as the 'Phase II MWA'. Phase II was practically completed in October 2017 and officially launched on 23 April 2018. Instillation of the additional antennas and commissioning of the array was led by the third MWA Director, Dr Randall Wayth. The MWA has been financially supported by the Australian Government under the National Collaborative Research Infrastructure Strategy (NCRIS), Education Investment Fund, and other research infrastructure programs. In May 2012 it was announced that Australia–New Zealand and South Africa would share hosting of the SKA project, a global megascience project to develop the world’s largest and most sensitive radio telescope. 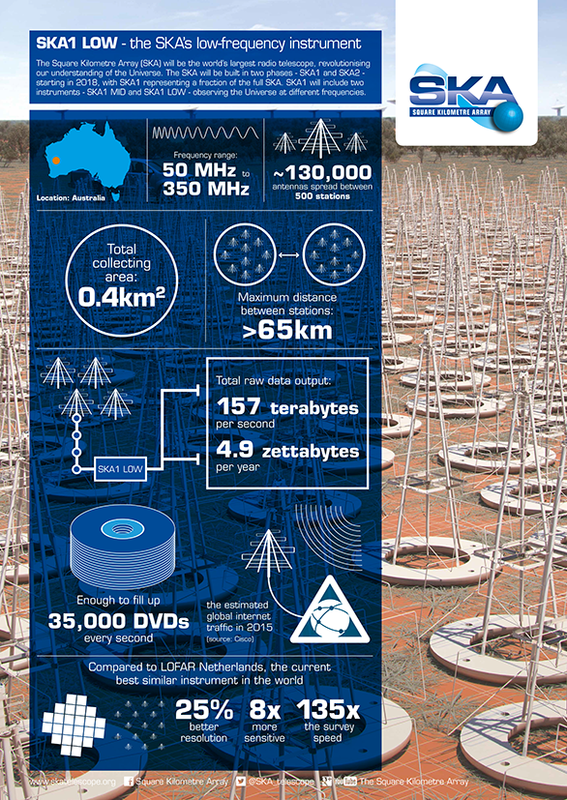 The entire low-frequency SKA (SKA-low or LFAA) will be built at CSIRO’s Murchison Radio-astronomy Observatory (MRO). The MWA is a technology and science precursor for the SKA. One of four precursor instruments developing the cutting-edge science and technology needed for the SKA at the two SKA sites, it is the only low-frequency precursor and is on the same site approved for SKA-low. The knowledge and expertise obtained through the development, construction and operation of the MWA will be directly applicable to the many science, engineering and computing challenges on the path to SKA-low. The MWA has already explored engineering solutions for low-cost, high-performance antennas, and addressed some of the computing challenges produced by very high data rates and volumes, and large-scale archives. The understanding of interferometric calibration and imaging is being pushed in highly innovative directions. In the years since its start of operations, the MWA has collected tens of petabytes of data and has observed for many thousands of hours. Ongoing algorithm development and refinement from interpreting this data will be directly relevant to the eventual processing of data from SKA-low. Additionally, the science programs for the MWA will inform the design of science experiments for SKA-low. 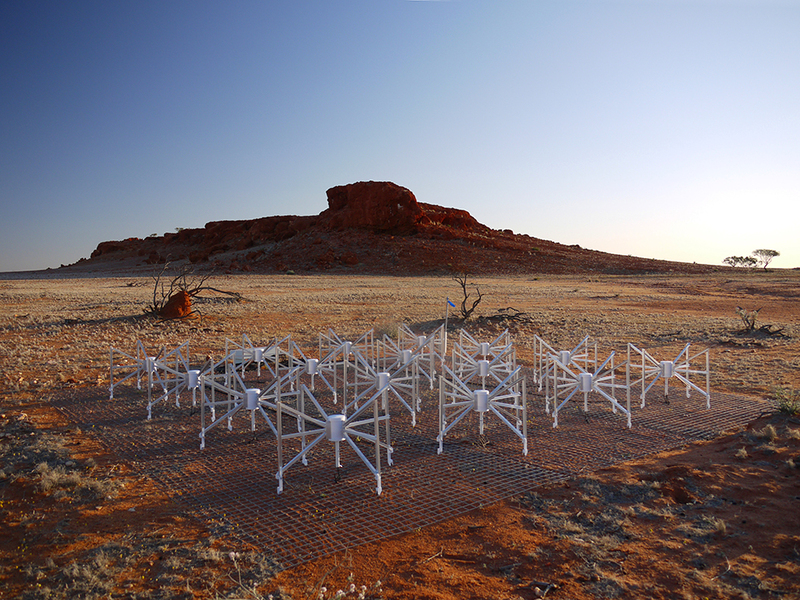 Image: SKA Precursor instruments, from left to right: ASKAP, MWA, MeerKAT and HERA. Image collage credit to SKA, from their brochure. Copyright © 2009-2019 Murchison Widefield Array. All rights reserved.